Plus Taiwan’s international role, China-Pakistan ties, and a cyber salvo in the Senkaku/Dioaoyu dispute. First, Carly Laywell of the Monterey Terrorism Research and Education Program, writing for USNI News, explores how Chinese investment in Africa affects U.S. counterterrorism. Her conclusion: “The massive influx of Chinese immigrants and investment in Africa pose significant obstacles to U.S. development and counterterrorism efforts in the region” by reinforcing “the preexisting political and economic issues that plague impoverished African nations.” To shore up U.S. interests, Laywell argues for increased U.S. aid in areas like public health and education to lay the groundwork for political and economic reforms. It’s a classic formulation of Chinese vs. U.S. engagement with Africa as a zero-sum battle for influence. Furthermore, we have Somini Sengupta, who writes for The New York Times about the U.S. and China’s shared interests in South Sudan. The piece explores whether the two countries can work together to halt the bloodshed. 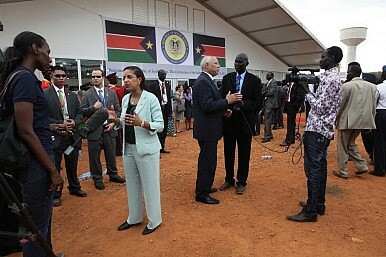 Apparently Washington and Beijing did come to some sort of consensus; a United Nations Security Council Resolution allowing for sanctions against the warring paries in South Sudan passed unanimously on March 3. In other news, the Center for Strategic and International Studies’ Bonnie Glaser and Jacqueline Vitello released a report analyzing how Taiwan’s exclusion from international security organizations harms both Taiwan itself and the world. The report outlines how Taiwan can contribute more to the global commons if allowed to play an expanded role in international organizations. Given Chinese President Xi Jinping’s tough talk recently on Taiwanese independence, the prospects don’t look great. Over at War on the Rocks, Raza Rumi looks at the proposed China-Pakistan Economic Corridor and how it will expand China’s influence in both South and Central Asia. She notes how critical the project will be for both sides – propping up Pakistan’s economy while also expanding Chinese influence (and opening up new markets for Chinese goods to boot). Rumi also looks at how security and political concerns have helped determine the route of the CPEC – to the consternation of local leaders from Kyber-Pakhtunkhwa (KP) and Balochistan provinces. The Diplomat’s own Franz-Stefan Gady already reported this week on China’s double-digit defense budget increase for 2015. However, for a different perspective, check out two articles that emphasize how China’s defense spending may actually be slowing: one piece from Bloomberg Business (linking the slowdown in budget increases to the PLA corruption crackdown) and one from Xinhua itself (which points out that “the 10.1-percent rise represented the lowest expansion in China since 2010”). John Kerry and Li Keqiang's overlapping tours in Africa highlight their different approaches to the continent.